Puff 'n' Stuff Geyser occurs in the Back Basin at Norris. It is very close to the wooden boardwalk and consists of a fissure-like vent in the side of the gentle slope. Puff 'n' Stuff Geyser makes a lot of noise, but doesn't seem to do much else! The eruptions are only a few feet high and often send a fine mist down the boardwalk after you. Around the fissure, there is often a build-up of a light grey-blue clay, perhaps formed by the interaction of the underlying rock with the hot mineral-rich waters erupting from the vent. The run-off from Puff'n'Stuff cools rapidly and plants quickly colonise this channel. 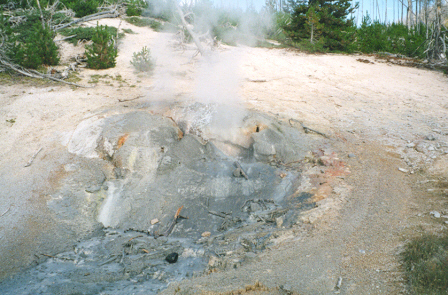 Sticks lying in the outflow from the geyser rapidly become coated in grey-white silica. This is the first stage in the fossilisation of plant remains in this area.